Leaves of Oakleaf Goosefoot are green and smooth above but densely mealy on the underside. Leaves are usually lobed and broadest toward the base, resembling oak leaves. Stems often have red streaks. Oakleaf Goosefoot is a weed that is most commonly found along the edges of ponds and reservoirs. 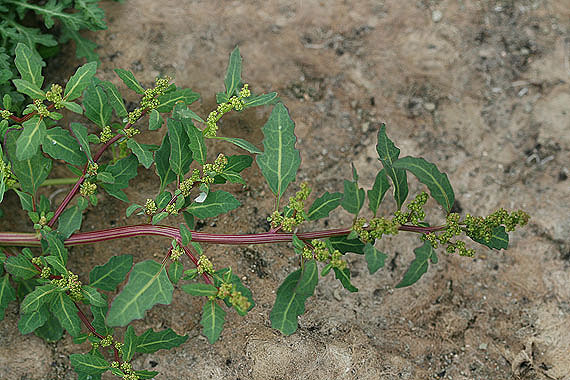 Plants in the genus Chenopodium are difficult to identify, but Oakleaf Goosefoot is one of the easier species to recognize.